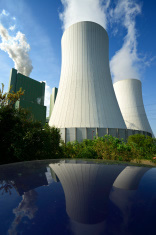 A leading nuclear power generation company in North America has embarked on a $20 billion initiative to refurbish its nuclear reactors in support of growing energy demands in the region and to maintain strict regulatory compliance standards. With the project funded by public dollars, it will be under intense scrutiny; its success will be critical for the region. The organization is accountable and responsible for keeping the project on track and ensuring it delivers value and also will be financially responsible for any overruns. All of these factors make efficient project execution essential to minimize the risk of unexpected costs and delays. Well aware that its core team of project managers would be retiring over the next several years and that newer team members may not have the experience to lead a project on such a large scale, the organization immediately began scoping what it would need to do to ensure the success of the project. After spending two days on-site, consulting with executives and interviewing key stakeholders, CEG spearheaded the development of a Strategic Talent Development Roadmap that will drive efficiency, reduce risk and improve competency and capability, not only in support of this important initiative, but for all programs across the organization. The client adopted a holistic approach to talent development that went beyond project management to encompass all of the support organizations surrounding the project and program teams. The company first needed to assess the capabilities of its project and program management organization. CEG conducted an effective, easy to implement, 180° competency assessment that included both subjective and objective components. Using the results from the assessment, and feedback from select interviews with key stakeholder groups, CEG collaborated with sponsoring executives to create a comprehensive capabilities development roadmap. After prioritizing the highest-value deliverables, this roadmap provides clear direction on talent development requirements for the next several years. Starting with a roles framework that defines critical team roles and executive sponsors, the role-based development plan blends delivery modes and learning approaches to maximize performance outcomes. By mapping targeted proficiency levels for project contributors to specific roles, the plan can then be executed using a blend of learning options, including skills training, just-in-time learning, executive briefings, coaching and mentoring. 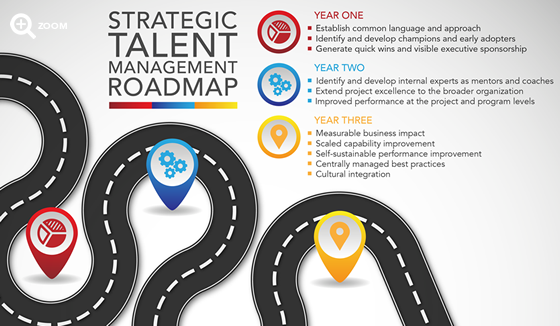 The client is now executing on the Strategic Talent Development Roadmap. Beginning with Project Management Fundamentals, training programs are being delivered for all role groups. Year One results in immediate value to the organization and sets the foundation for the assimilation of newly learned and enhanced skills in Year Two. In Year Three, cultural integration begins, enabling self-sustaining performance and measurable business impact. In addition to rolling out the training, CEG is working with the organization to define key short- and long-term measures to evaluate trends and outcomes throughout this transformational program.